This guest post came about from a mutual love of tennis and the result of a wager for the Ronald Garros final match, in which Rafael Nadal won over Novak Djokovic. David Wiseman works at Kahena Digital, a Jerusalem online marketing and SEO Company and can be found on twitter at @daw1975. Let’s bring the worlds of tennis and SEO together again: Here are the 13 things the game of tennis has in common with SEO. 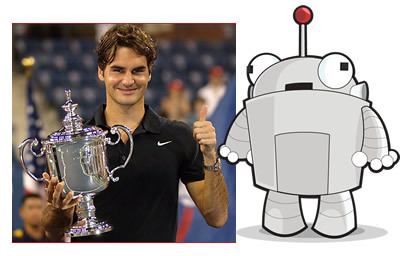 Just as in SEO, ranking are everything in tennis. As a tennis player, not a day goes by where you aren’t aware of your ranking. It defines you. With any rankings there can be quirks, such as Danish player Caroline Wozniacki. There was much consternation that she got to Number One without having won a grand slam title. Similarly, occasionally there is much angst and dismay as to the inequality and illogic of Google’s rankings. Ranking highly shouldn’t be the sole focus but a happy by-product. People should look at the rankings as part of the journey and not just the destination. If you don’t, things are finished once you get to #1 as opposed to only just beginning. A tennis match can be broken down into hundreds of different statistical categories – first serve %, unforced errors, break point converted, winners, etc. SEO has so many numbers rankings, visits, conversions, time on site, bounce rate, et al that it comes down to which ones you look at and show the client and which ones you don’t show the client. In SEO, it’s not as black and white. Some SEO folk say that conversions have nothing to do with them. That once the traffic comes to the site, their job is done. I am not of that opinion but if a person is, it’s hard to argue with them. That’s like arguing Bjorn Borg is the best clay court tennis player of all time. You will go back and forth on this for hours and not get anywhere. In tennis, if there are any weaknesses in your game, quickly they are going to be found out. Whether it’s your second serve, backhand or volleying, opponents are going to identify these weaknesses and then start hammering away at them – forcing you into positions where your weaknesses are exposed. The more all-round player you are, the harder it will be to defeat you. It’s human nature to stick to what we’re good at and what we like to do and eschew the rest, but the more kinks we eliminate from our game the more versatile and stronger we become. Some people can’t stand analytics and do everything they can to avoid it, some hate outreach, interacting with clients, presenting & public speaking, programming, working to deadlines, pivot tables, punctuality, etc. The more strings we add to our racquet, the more valuable we become. This is relevant to tennis as you want to prevent your opponent from scoring any points. It’s a different kind of love in SEO. The Beatles weren’t lying when they sang, “The love you take is equal to the love you make.” SEO is a world filled with different opinions and ways of doing things but there is nothing to gain by taking the high moral ground or a holier than thou attitude. Tennis player spend hundreds of hours practicing. How much time do you spend on your SEO game? Do you put in the hours reading and commenting on blogs, following tweets and staying abreast of other industry news? You have to make it part of your schedule otherwise you are going to lose your edge. In tennis, the racquet you use is of critical importance. It is the tool of your trade and it needs to feel comfortable in your hand. While you may stay wedded to your current make and model, it behooves you to know what else is out there, try it out and possibly even switch. In SEO, the technology changes so quickly that it is almost impossible to keep track of. There are tools coming out all the time for every aspect of the industry. It’s important to find balance between always changing the way you work to be blindly loyal to it. Find that middle ground. It is common for players to climb in to the stands following a win and share the moment with their entourage. Similarly while one or two people may be the figureheads of a campaign or pitch, there is a whole team responsible for its success. In tennis you are talking about a coach, manager, dietician, nutritionist, yoga instructor, pilates teacher, masseuse and physiotherapist. In the SEO word you have all the staff who work on a campaign. It’s important that their hard work is both recognized and appreciated. Over the years you have worked out a game plan that you feel is best to your game. You are going to tweak it according to your opponent, but if things aren’t working, don’t be afraid to shake things up and try something else. Suffice to say that if you are two sets to love down, you have to try something different. So too with a campaign if the numbers aren’t moving in the right direction, you may have to change tack. You could be stubborn and hope that things turn around on their own and this could well be the case, but sometimes you have to re-assess things and mid-campaign be prepared to implement a new game-plan. In tennis, there are two types of players – those who try to hit winners and those who are simply trying to keep the ball in play. Going for winners is a high risk/reward play and being risk averse may protect you from things going horribly pear-shaped but you aren’t going to get anywhere. In your SEO campaign if you believe in yourself and what you are doing you should have the confidence to go for it. Sometimes only 4 out of every 10 ideas work, but for four to be spectacular successes, six aren’t. That’s life. You can’t let the fear of failure paralyze you otherwise it’s going to become a self-fulfilling prophecy. If we were playing in the final of the French Open we would be pumped up, motivated and focused. Playing in a tiny tournament on a back court in Uzbekistan we may find that we are not as switched on. Working on a campaign for a Fortune 500 client is stimulating and invigorating and that requires no motivational talks to ram home the import of it, the ramifications of doing well and more so, those of not doing so. On a smaller client, energy levels just aren’t going to be the same. That’s human nature but if you treat it lightly or neglect it, it could well disappear. Sometimes it just isn’t your day. You’re going to lose and it’s important that you are a good loser as much as you are a good winner. The good winner isn’t much of an issue in SEO where gloating is just another word for celebrating; but being a good loser is definitely important in SEO. Don’t be the person who plays the blame game and starts ranting and raving while pointing the finger. You can blame Google, the client, your colleagues, a lack of caffeine and faulty data, but ultimately you have to put your hand up and say that it’s on you. A sense of humor is a must in SEO otherwise you aren’t going to last too long. Novak Djokovic turned things around when he was able to make fun of himself. He loosened up which is something that an uber uptight Ivan Lendl never managed. This clip of Djokovic is from the 2007 US Open. He lost the final there but the next Grand Slam he played in, he won and this was his first Grand Slam title. He has never looked back.